Dan O'Shea, a former Navy SEAL officer, offers his take on Benghazi for the Tampa Bay Times. It is ironic that the House Select Committee on Benghazi released its report on the anniversary of Operation Red Wings, the 2005 rescue mission that was the largest one of the Afghanistan conflict. A four-man SEAL reconnaissance team was compromised and ambushed by an overwhelming enemy force. When the "troops-in-contact" call came into headquarters, the mission shifted immediately to a personnel recovery one. Fellow SEALs boarded Army helicopters and departed on a daylight Quick Reaction Force rescue operation despite the obvious danger and numerous unknowns on the ground. Americans were desperately fighting for their lives, and "leave no man behind" is an operating principle that needs no explanation to anyone in the military. The rescue helicopter was shot down by a rocket-propelled grenade, killing everyone on board including eight Navy SEALs and eight Army air crew. That we lost 16 men trying to save four others was tragic, but it was accepted as how we in the special operations community do business. A reaction force always on standby to launch at a moment's notice is standard operating procedure. Compare that response to the State Department's on Sept. 11, 2012, in Libya from the Benghazi report timeline and actions taken by the department's leadership. The initial reports came in on the consulate attack, the priority was obviously not on "leaving no man behind." Note: Above is the 13 Hours movie poster. I recently watched this outstanding film. I knew most of the facts concerning the Benghazi incident prior to watching the film and the film offers a fine depiction of what happened. 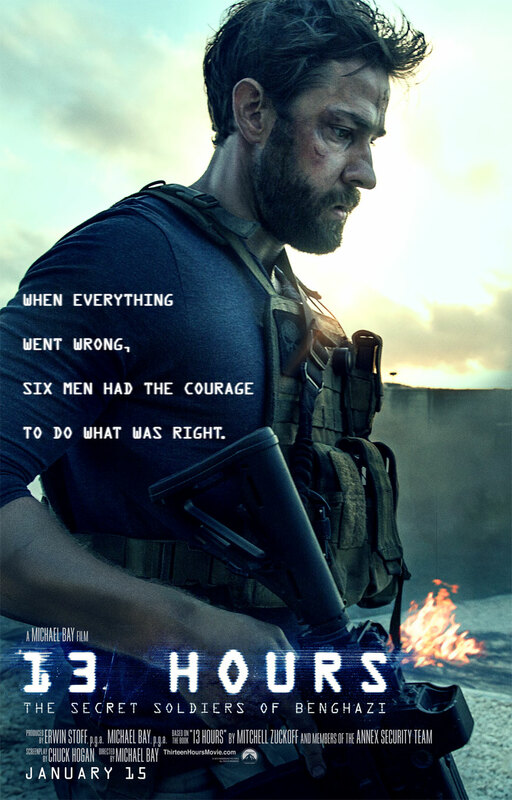 The film, quite rightly, stayed clear of politics and simply illustrated the bravery, the military skill and the honor of the CIA contractors and U.S. Government personnel who were on the ground in Benghazi that fateful day. I was furious at the disgraceful inaction of the Obama administration, the Hillary Clinton U.S. State Department, the CIA and the Defense Department when the incident happened. My anger returned while watching this great film. I highly recommend it.